Our two newsletters, the German “Ruf” and the English “Courier” are issued four times a year in March, June, September and December. 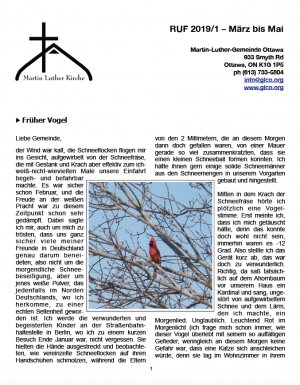 If you would like to receive the “Courier” or the “Ruf” by e-mail, please let us know sending an e-mail to lutherinfo@gmail.com – we would love to put you on our mailing list. You may also receive the newsletter by post on a regular basis and at no charge (even if you are not a member of the congregation). Please check the mailing address on the envelope and inform us about changes and corrections.